Wednesday 27 March 2019, by Pierre, 35 visites. We present here the report he wrote to the Emperor following the destruction of his ship "le Redoutable" during the Battle of Trafalgar, from October 21 to 23, 1805. He is then a prisoner of the British, aboard the ship the "Swiftsafe". Le Redoutable (centre) combat le HMS Victory (à sa gauche) et le HMS Temeraire (à sa droite), tableau peint par Louis-Philippe Crépin en 1807. No more brilliant defence, no nobler fight in battle, perhaps, was ever made by the French, on sea or land, than that by the “Redoutable” at Trafalgar. One “crack” regiment of the Line in the French Army of to-day commemorates the bravest deed in its annals by the legend on its colours : “ Rosny, 1814 :—Un contre Huit ! ” Another, similarly, recalls the finest feat of arms in its history, by the legend : “ Un contre Dix :— Grâtz, 1809 ! 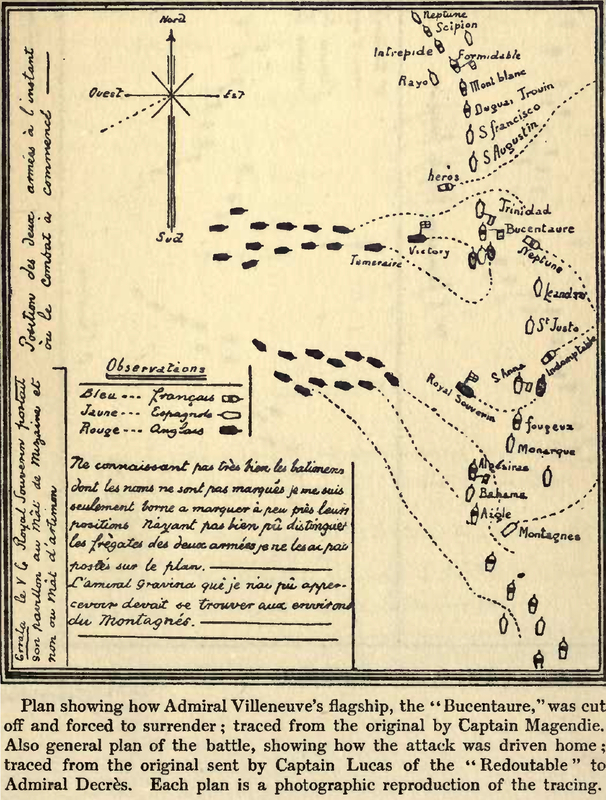 ” But the feat achieved in either of these cases can hardly compare with the determined and enduring valour of the stand that the two-decker “Redoutable” made at Trafalgar, single-handed, against the two British three- deckers “Victory” and “Téméraire.” “Le Redoutable,” to use the words of a distinguished Frenchman, “ne s’était rendu qu’après le combat peut être le plus sanglant et le plus opiniâtre de tous ceux qui ont honoré la valeur des Français.” Also, the personal heroism displayed by Captain Lucas, the captain of the ship, deserves to rank with the classic instances of the gallantry of D’Assas, captain in the famous regiment “ d’Auvergne,” of the army of the old régime, whose magnificent act of self-sacrifice on the battlefield, the modem French cruiser “ D’Assas ” exists to recall to-day ; or the grand display of the “First Grenadier of France,—dead on the field of honour”; with even the dauntlessness of the “bravest of the brave,” Marshal Ney himself. Two official statements detailing what passed on board the “ Redoutable ” at Trafalgar are extant among the archives of the Ministry of Marine in Paris. The earlier one was drawn up immediately after the surrender of the ship, while Captain Lucas and his surviving officers were prisoners on board the British “ Swiftsure,” and still off Cadiz. It is entitled : “ Procès verbal de la perte du vaisseau de S. M. I. et R. Le Redoutable, Commandé par M. Lucas, Capitaine de Vaisseau, Officier de la Légion d’Honneur. The following is a transcript of the original first- draft of the Procès Verbal, as committed to paper and signed on board the “ Swiftsure.” The original document is now in the possession of Mme. Mérienne Lucas Jobard, of Passy. A copy of it, made by M. Destrem, the Conservateur, was recently presented to the Musée de la Marine at the Louvre, on the walls of which it is now exhibited. There is also the fair-written document, actually presented to Decrès, that is in the archives of the Ministry of Marine. “Procès verbal de la perte du V. de S. M. I. & R. le Redoutable, commandé par M. Lucas, cap. de V. officier de la Leg. d’honneur"
“This day, 1st de Brumaire, An XIV (the 23rd of October), we, the undersigned, E. Lucas, Captain and Officer of the Legion of Honour, having the command of His Majesty’s ship Le Redoutable, together with the officers of the Etat Major (commissioned officers), under-officers, etc., finding ourselves brought together on board the English ship Swiftsure, and having survived the loss of our own ship, have drawn up the following report, containing the reasons and circumstances which occasioned the loss of the Redoutable. “On the 21st of October (29th Vendémiaire), at half-past eleven, the Combined Fleet found itself to windward of the enemy, forming in line of battle. The Redoutable, according to the order of seniority, was third ship astern of the admiral’s flagship, the Bucentaure. The two intermediate ships, in the course of an evolution, owing to want of wind, were out of station and left the admiral’s ship exposed just at the moment when the enemy had made his dispositions for attacking our centre. The Victory, of 110 guns, under Admiral Nelson, and the Téméraire, of the same rate, were at the head of the division which bore down upon the admiral’s ship to cut it off and surround it. Captain Lucas, soon perceiving the enemy’s design, immediately took measures to take post close up in wake of the Bucentaure, in which he happily succeeded. Although the flag-captain from on board that ship hailed us several times to shorten sail, we kept close astern. We had all unanimously determined rather to lose our own ship than witness the capture of our admiral. “At a quarter before twelve firing opened on both sides between the ships that were within gunshot. The enemy’s two three-deckers directed all their efforts to forcing in our line in wake of the Bucentaure, and to drive the Redoutable foul of her, so as to make our admiral’s ship cease firing. They were, however, unable to move us. We determined to range ourselves alongside the enemy’s admiral, and in that situation we gave and received a number of broadsides. The enemy, however, could not prevent us from lashing ourselves fast to the Victory. Our captain then gave orders to board, whereupon our brave crew, with their officers at their head, instantly made ready for the onset. The conflict was begun with small arms, and upwards of two hundred hand grenades were flung on board the Victory. Admiral Nelson fought at the head of his crew (l’amiral Nelson combattait à la tête de son équipage), but still, as our fire was much more vigorous than that of the English, we silenced them in about a quarter of an hour. The deck of the Victory was strewn with dead, and Admiral Nelson was killed by a musket shot (l’amiral Nelson fut tué d’un coup de fusil). It proved, however, unexpectedly difficult to board the Victory ; her upper deck stood so much higher than that of the Redoutable. Ensign Yon, however, and four seamen, climbing up by an anchor, succeeded. They would have been followed by the rest of their brave comrades, but, at that moment, the English ship Téméraire, perceiving that the fire of her admiral’s flagship had ceased, and that she must inevitably be taken (Le Téméraire qui s’etait aperçu sans doute que l’amiral anglais ne combattait pas et allait infailliblement être pris), immediately fell upon us on our star-board side, after first raking us with a heavy fire. The slaughter that ensued is indescribable. More than two hundred of our men were killed. The captain now ordered the remainder to go below and fire at the Téméraire with what guns were not disabled. Immediately after that there came up astern another of the enemy’s ships, within pistol shot of us ; in which station she remained till we had to strike our colours. “1. Because, out of a crew consisting of six hundred and forty-three men, five hundred and twenty-two were no longer in a situation to continue the fight. Three hundred had been killed, and two hundred and twenty-two were badly wounded. Among the latter were the whole of the Etat Major and ten junior officers. “ 2. Because the ship was dismasted : the main and mizen masts had gone by the board (dematés au raz du pont). The former fell on the Téméraire, and the yards of that ship fell on board the Redoutable. “ 3. Because the tiller and helm and rudder gear and the stem-post itself had been entirely destroyed. “ 4. Because nearly all our guns were dismounted (la presque totalité de l’artillerie était entièrement démontée) partly in our coming into collision with two three-deckers, partly by their shot, and several of the guns dismounted, and in consequence of the bursting of an eighteen-pounder gun on the lower deck, and a thirty-six-pounder carronade on the forecastle. “ 5. Because the poop had been entirely smashed in (la poupe était entièrement crevée) and the counter timbers and deck beams shattered and wrecked so that the whole of the after part of the ship formed practically a gaping cavity (tellement hachées que toute partie ne formait qu’un large sabord). “6. Because almost all the port lids had been smashed and the ports destroyed by the fire of the Victory and Téméraire. “7. Because both sides of the ship and the decks were shot through and riddled in such a manner that numbers of the wounded below on the orlop, and as they lay in the cockpit, were being killed helplessly. “ 8. Because the ship was on fire astern. “9. Because, finally, the ship was leaking in many places, and had several feet of water in the hold, and nearly all the pumps had been destroyed by shot. We had cause to fear that she might go down under our feet. “Throughout the whole of the battle, the Victory and Téméraire never ceased their attacks upon the Redoutable ; nor did we separate from each other for some time after the battle had ceased between the rest of the fleets. The Victory lost her mizen-mast, her rigging was nearly cut to pieces, and a great part of her crew were disabled. Admiral Nelson was killed by a musket shot during the attempt to board. “ At seven in the evening the Swiftsure took us in tow, and next morning sent a party on board to take charge and remove Captain Lucas, Lieutenant Dupotet, and M. Ducrest. By noon the leaks had increased so much, that the prize-master signalled for assistance. The Swiftsure sent her boats to save the remainder of our crew, but they had only the time to remove one hundred and nineteen Frenchmen. About seven that evening the whole of the stem being under water, the Redoutable went down with all the wounded on board. On the 23rd (lère Brumaire) the captain of the Swift- sure seeing some people at a distance on a wreck, caused them to be brought in, to the number of fifty, but, including sixty-four of the wounded, who were taken out, not more than one hundred and sixty-nine were saved out of four hundred and sixty-three. “ On board the Swift-Sure. “Signed by the Officers of the quarter-deck ’and confirmed by	“ Captain Lucas. Hosteau : asp. de 1re cl. Maubrat : asp. de 2° cl. “Although the loss of the Redoutable forms a part of the defeat undergone by the Combined Fleets of France and Spain in the sanguinary battle off Cape Trafalgar, the part taken by this particular ship, all the same, deserves a distinguished place by itself in the annals of the French Navy. In consequence I owe it to the memory of the brave men who fell in the terrible fight, or went down in the remains of the Redoutable when she sank, I owe it also to the glory of the small band of those who survived that inexpressible slaughter, to bring under the notice of your Excellency a picture of their exploits, the efforts of their valour, and above all the expressions of their love for, and attachment to, His Imperial and Royal Majesty, whose name, repeated a thousand times with the utmost enthusiasm, seemed to render them invincible. Nothing could equal the ardour of such heroes at the moment that I announced to them that we were going to board the English flagship ; and not even the intrepid Nelson himself could have died more nobly than in combating enemies so worthy of his courage and of his grand reputation. “ The enemy’s column, which was directed against our centre, was at eleven o’clock on the port side, and the flagship Bucentaure began firing. I ordered a number of the captains of the guns to go up on the forecastle and observe why it was some of our ships fired badly. They found that all their shots carried too low and fell short. 1 then gave orders to aim for dismasting, and above all to aim straight. At a quarter to twelve the Redoutable opened fire with a shot from the first gun division. It cut through the foretopsail yard of the Victory, whereupon cheers and shouts resounded all over the ship. Our firing was well kept up, and in less than ten minutes the British flagship had lost her mizen-mast, foretopsail, and main topgallant mast. Meanwhile I always kept so close to the Bucentaure that several times they called to me from their stem gallery that I should run them down ; indeed, the bowsprit of the Redoutable touched the crown of the flagship’s taff- rail ; but I assured them they had nothing to be anxious about. “The damage done to the Victory did not affect the daring manœuvre of Admiral Nelson. He repeatedly persisted in trying to break the line in front of the Redoutable, and threatening to run us down if we opposed. But the proximity of the British flagship, though closely followed by the Téméraire, instead of intimidating my intrepid crew, only increased their ardour ; and to show the English admiral that we did not fear his fouling us, I had grappling irons made fast at all the yardarms. “ The Victory having now succeeded in passing astern of the French admiral, ran foul of us, dropping alongside and sheering off aft in such a way that our poop lay alongside her quarter-deck. From this position the grappling irons were thrown on board her. Those at the stem parted, but those forward held on ; and at the same time our broadside was discharged, resulting in a terrible slaughter. We continued to fire for some time, although there was some delay at the guns. We had to use rope rammers in several cases, and fire with the guns rim in, being unable to bowse them, as the ports were masked by the sides of the Victory. At the same time, elsewhere, by means of muskets fired through the ports into those of the Victory, we prevented the enemy from loading their guns, and before long they stopped firing on us altogether. What a day of glory for the Redoutable if she had had to fight only with the Victory ! The English batteries, not being able to resist us longer, ceased firing (les batteries du Victoire ne pouvaient plus nous riposter) . Then I became aware that the crew of the enemy were about to attempt to board us. At once I had the trumpets sounded, giving the divisional call for boarding. All hastened up from below instantly, in fine style ; the officers and midshipmen sprang to the head of their men, as though at a parade. In less than a minute our decks swarmed with armed men, who spread themselves with rapidity on the poop and in the nettings and the shrouds. It would be impossible to say who was the foremost. “Then a heavy fire of musketry opened, in which Admiral Nelson fought at the head of his crew. Our firing, though, became so rapid, and was so much superior to his, that in less than a quarter of an hour we had silenced that of the Victory altogether. More than two hundred grenades were flung on board her, with the utmost success ; her decks were strewn with the dead and wounded. Admiral Nelson was killed by the firing of our musketry. “ Immediately after this, the upper deck of the Victory became deserted, and she again ceased firing, but it proved difficult to board her because of the motion of the two vessels, and the height of the Victory’s upper tier and battery. On that I gave the order to cut the supports of the main-yard so that it might serve1 as a bridge. At the same time Midshipman Yon and four seamen sprang on board the Victory by means of her anchor, and we then knew that there was nobody left in the batteries. At that moment, when my brave fellows were hastening to follow, the three-decker Téméraire, which had seen that the Victory fought no longer and must without fail be taken (allait infailliblement être pris), came down, full sail, on our starboard side. We were immediately under the full fire of her artillery, discharged almost with muzzles touching. “It is impossible to describe the carnage produced by the murderous broadside of this ship. More than two hundred of our brave men were killed or wounded by it. I was wounded also at the same time, but not so seriously as to make me abandon my post. Not being able to undertake anything on the side of the Victory, I now ordered the rest of the crew to man the batteries on the other side and fire at the Téméraire with what guns the collision when she came alongside had not dismounted. “The order was carried out; but by this time we had been so weakened, and had so few guns left available, that the Téméraire replied to us with great advantage. A short time afterwards another ship, a two-decker, whose name I cannot recall, placed herself across the stem of the Redoutable and fired on us within pistol-shot. In less than half an hour our ship had been so fearfully mauled that she looked like little more than a heap of débris. Judging by appearances, no doubt, the Téméraire now hailed us to surrender and not prolong a useless resistance. My reply was instantly to order some soldiers who were near me to fire back ; which they did with great alacrity. At the same moment almost, the mainmast of the Redoutable fell on board the English ship. The two topmasts of the Téméraire then came down, falling on board of us. Our whole poop was stove in, helm, rudder, and stem post all shattered to splinters, all the stem frame, and the decks shot through. All our own guns were either smashed or dismounted by the broadsides of the Victory and Téméraire. In addition, an 18-pounder gun on the lower deck, and a 32-pounder carronade on the forecastle had burst, killing and wounding a great many men. The hull itself was riddled, shot through from side to side; deck beams were shattered ; port-lids torn away or knocked to pieces. Four of our six pumps were so damaged as to be useless. The quarter-deck ladders were broken, which rendered communication with the rest of the ship very difficult. Everywhere the decks were strewn with dead men, lying beneath the débris. Out of a crew of 634 men we had 522 hors de combat; of whom 300 were killed and 222 wounded—nearly all the officers among them. A number of the wounded were killed on the orlop deck below the water-line. Of the remaining 121, a large number were employed in the storerooms and magazines. The batteries and upper decks were practically abandoned—bare of men, and we were unable longer to offer any resistance. No one who had not seen the state of the Redoutable could ever form an idea of her awful condition. Really I know of nothing on board that had not been hit by shot  In the midst of this horrible carnage and devastation my splendid fellows who had not been killed, and even, too, the wounded below on the orlop, kept cheering ‘ Long live the Emperor ! We are not taken yet ! Is the Captain still alive?’ (‘Vive l’Empereur! Nous ne sommes pas encore pris ! Le Commandant, vit il encore?’) Some tarred canvas at the stem took fire about this time, but happily the flames were held in check, and we succeeded before long in extinguishing them . “The Victory by this time fought no longer. She busied herself only with getting clear of the Redoutable. We, however, meanwhile were being cut to pieces by the cross fire from the Téméraire, with whom we still fought, and from the other ship, which was still firing into us at the stem. Unable to meet that fire, and not seeing any chance of rescue, the rest of our ships being all too far to leeward to be able to come to our assistance, I hesitated no longer about surrendering. The leaks were sufficiently serious to ensure the ship going to the bottom, so that the enemy would not keep her. When I satisfied myself finally about this, I gave orders to lower the colours. The flag, however, came down by itself with the fall of the mizen-mast . We were then left by the ship which had been firing into us astern, but the Téméraire continued to fire on us. She did not give over until her men were obliged to do so by having to work at extinguishing a fire which had broken out on board their own ship. It was then half-past two in the afternoon. Captain Lucas then describes what followed the surrender. “The enemy took no steps to take possession of the Redoutable, in which the leaks were so considerable that I feared the ship would sink before they would be able to get the wounded out. I represented the state of things to the Téméraire, and warned them that unless they took steps at once to send men on board with gear for the pumps and give us immediate succour, I would have to set fire to the ship, which would involve the Téméraire and the Victory. Immediately after that two officers and some seamen and marines came on board and took possession of the ship. One of the English marines, who entered on the lower deck through a port, was attacked by one of our wounded sailors armed with a musket and bayonet. He fell on the Englishman with fury, shouting, ‘ I must kill one more of them ! ’ He bayoneted the marine through the thigh, and the man fell between the two vessels. In spite of this incident, however, I was able to induce the English party to remain on board. They wanted to return to their own ship and leave us. “ Towards three o’clock some of the ships of our van squadron which were to windward on the starboard tack and apparently about to draw off from the battle, without having been perceptibly damaged, fired several shots at our group, but from a long range. Several of their cannon balls fell on board the Redoutable, and one of the English officers had his thigh shattered and died in a few moments. “ At half-past three, the Victory separated herself from the Redoutable, but she was in so dismantled a state as to be hors de combat . It was not until seven in the evening that they were able to get the Redoutable clear of the Téméraire, which still, however, remained foul of the Fougueux. We had not yet been formally taken possession of, but the English Swiftsure now arrived and took us in tow. “We spent the whole of that night at the two pumps which were all that remained workable, without, however, being able to keep the water under. The few Frenchmen who were able to do duty joined with the English party on board in pumping, stopped several leaks, blocked up the port holes and boarded in the poop of the ship, which was ready to cave in. Indeed, no toil was too hard for them. In the middle of all the turmoil and horrible disorder on board, just keeping the ship above water, with the ’tween-decks and batteries encumbered with dead, I noticed some of my brave fellows, particularly the young midshipmen, of whom several were wounded, picking up arms which they hid on the lower deck, with the intention, as they said, of retaking the ship. Never were so many traits of intrepidity, of valour and daring, displayed on board a single ship ; the whole history of our navy can show nothing like them. “Next morning the captain of the Swiftsure sent a boat to take me on board, together with Lieutenant Dupotet and Midshipman Ducrest, and we were duly conducted there. At noon the Redoutable lost her foremast, the only mast she had left. At five in the evening the water continued so to gain on the pumps that the prize- master made signals of distress, and all the boats of the Swiftsure were lowered to rescue the crew. It was blowing very hard at the time, and the sea ran very high, which made the getting out of the wounded very difficult. These poor fellows, on its being seen that the ship was going down, were nearly all brought up and laid on the quarter-deck. They were able to save several of them. At seven in the evening the poop was entirely submerged. The Redoutable sank with a large number of the wounded still on board. They met their death with courage worthy of a better fate. A hundred and sixty-nine men, forming the remainder of the brave crew of the Redoutable, found themselves together on board the English ship. Seventy of the number were badly wounded and sixty-four of the rest had less serious wounds. All the wounded were sent into Cadiz under a flag of truce, and in the end only thirty-five men from the Redoutable were taken to England as prisoners of war. “The results of the battle as regarded the Redoutable were these : the loss of the ship and destruction of three-quarters of her crew. On the other hand, single-handed, she had throughout the battle engaged the attention of two three-deckers, the Victory and Téméraire ; and in this way had fully occupied Admiral Nelson himself, who, taken up with this one encounter, could only free himself by excessive daring. England has lost the hero of her navy, who fell before the brave men of the Redoutable. More than three hundred men, several of them superior officers, were put hors de combat on board the enemy’s ships. The Victory lost her mizen topmast in the action and main topgallant mast ; and in general all her yards were badly damaged and also the wheel. The Téméraire lost two of her topmasts ; two lower yards, and her helm and rudder were destroyed by the guns of our upper deck. Both ships had to return to England to undergo large repairs. “ I add to this report a return of the ship’s company of the Redoutable, both before and after the battle. It will show you the loss of men of each class. I also add a list of the officers by name, both of the Etat Major and the midshipmen. The praise and commendation due from me to one and all are beyond expression. No one who did not see the valour of the officers and young midshipmen told off to lead our boarding parties can form an idea of their ebullient ardour, their splendid audacity—especially when, at the head of the brave men that each commanded, they stood in front of the boarding-nettings, armed some with pistols and cutlasses, others with carbines, all directing the fire of the musketry and the flinging of the grenades. In this, the officers of infantry and those of the ship, the sailors and soldiers alike, all displayed unsurpassable courage, and in presenting my list of them it is impossible to name which were the most meritorious. “Monseigneur, I have the honour to be your Excellency’s most humble and obedient servant. Lucas (Jean Jacques Etienne) capitaine de vaisseau commandant. Blessé. Dupotet (Henri Joseph) lieutenant en pied. Blessé. Briamant (Elie François) lieutenant de vaisseau, provisoire. Tué. Pouloin (François Louis) id. Tué. Maïol (Jean François) enseigne de vaisseau, faisant fonctions de lieutenant de vaisseau. Blessé. Laity (Jean François) enseigne de vaisseau. Blessé. Tresse (Claude Joseph) lieutenant d’artillerie de marine. Tué. Péan (Jean Louis) agent comtable. Bohan (Allain) officier de santé en chef. Guillaume (Louis) Capitaine du 79e régiment. Blessé très grièvement. Chauvin (Pierre) lieutenant du 79e régiment. Medeau (Jean) sous lieutenant du 79e régiment. Tué. Auroche (Louis) capitaine au 6e dépôt colonial. Blessé. Neury (Charles) lieutenant du 6e dépôt colonial. Tué. Blondel (Quentin Henri-Auguste) capitaine d’artillerie de marine. Chafange (Charles) capitaine de 16e régiment. Tué. Savignac, sous lieutenant du 16e régiment. Tué. Hosteau (Louis Charles) aspirant de lr® classe, faisant fonctions d’enseigne de vaisseau. Blessé. Laferrière (Philippe Gautier) id. Tué. Daubré (Joseph) aspirant de 2e classe. Tué. La Fortelle (Henri) id. Blessé. Le Férec (Theodore) id. Blessé. The awful loss among the officers comes out even more strongly when the foregoing list is analyzed in detail. Out of twenty-nine officers of all ranks, twelve were killed and ten (including Captain Lucas) were wounded. Seven only escaped unhurt; and these included the surgeon and the purser, who were stationed in comparative safety below. Of six lieutenants and acting lieutenants, two were killed and three wounded. Of eleven sub-lieutenants and midshipmen, five were killed and four were wounded. Of eight officers of the troops on board, four were killed and three were wounded. With the sanction of the British Admiralty, according to a French account , as a mark of distinction in connexion "with his fine defence of the “Redoutable,” Captain Lucas’s sword was returned to him a little time after his arrival in England. It was, we are told, ceremoniously handed back to him at a supper party in London given for the occasion by Lady Warren, the wife of Admiral Sir John Borlase Warren. Whether this was really so or not, the sword has since disappeared. The descendants of Captain Lucas do not possess it, and have no idea of its whereabouts, although they treasure with devoted pride other Trafalgar relics of their ancestor. Under the Second Empire the name “ Redoutable” was given to one of the first men-of-war added to the navy of France by Napoleon III, a magnificent 90-gun ship, and there is a battleship “ Redoutable ” in the French Fleet at the present hour. Several pictures of the “Defence of the Redoutable at Trafalgar” have been exhibited at the Salon. 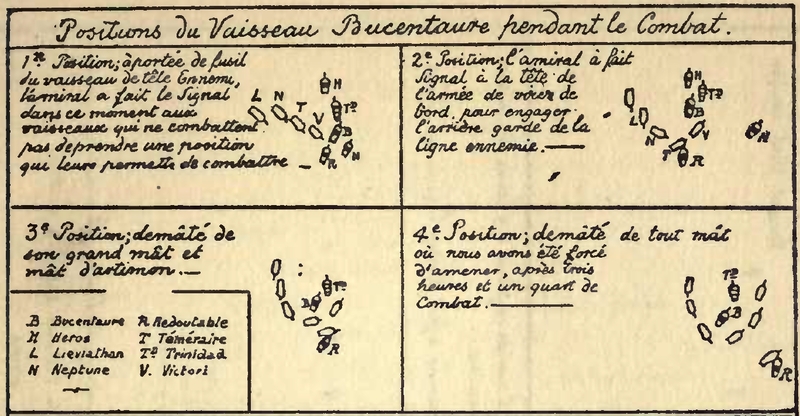 A very interesting set of sketches in Indian ink, showing the movements of the “ Redoutable ” and details of the battle in her neighbourhood, was made at Captain Lucas’s instance. Copies are in the Musée de la Marine at the Louvre, which by permission of Captain Lucas’s family, and the Conservateur of the Musée de la Marine, are reproduced in this book. The “ Victory ” got clear, according to English accounts, before two o’clock. H. Moulin, “ Les Marins de la République,” p. 132. The seal is now in the possession of Captain Lucas’s grandson, M. Cléree, of Auteuil, a member of the French Bar. The last French survivor of Trafalgar, Louis André Manuel Cartigny, of Hyères, died in 1892, at the age of a hundred and one. He was a “mousse,” or powder-monkey, on hoard the “Redoutable” in the battle, where he was slightly wounded. Cartigny was brought to England, and remained a captive on board the hulks at Plymouth, at Dartmoor, and in the war-prison at Stapledon, near Bristol, for some years. Later he was exchanged, and, returning to France, was attached to the “ Seamen of the Guard,” with whom he was present at Fontainebleau on the memorable occasion in 1814 when the Emperor made his pathetic adieu to the Grand Army. Cartigny received the St. Helena pension of 260 francs, and was decorated by Napoleon the Third with the Legion of Honour. He was present at Chislehurst on the occasion of the Prince Imperial’s funeral, as one of the “ St. Helena Medallists.” He died at Hyères, where he had spent the later years of his life as landlord of the Grand Café des Quatre Saisons, on the Cours de Strasbourg. As it happened, the funeral of France’s last Trafalgar veteran occurred just as Queen Victoria was arriving at Hyères for some weeks stay in the neighbourhood, and as soon as she heard of it Her Majesty sent a wreath to be placed on the veteran’s grave, with a sympathetic message to his surviving daughter and an expression of regret that she had not known before of the death or she would have been represented by an equerry at the graveside.